TrishyB says: 32: Hey! Rome's full of rude Italians! If you're looking for a book that will reinforce every stereotype you've ever read about any country in Europe, you've found it here. 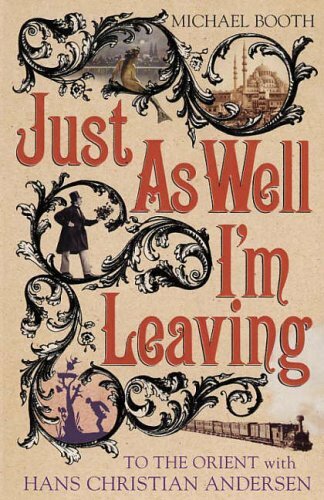 On the surface, Michael Booth's Just as Well I'm Leaving is an entertaining idea to part publishers and readers from their money. Hey, the high concept says, I'm going to follow Hans Christian Andersen's footsteps across Europe, tell you something about him on the way, and have a good laugh! So far, so standard proposal. Andersen turns out to be a fascinating character. Crazy, gangly, unattractive, maybe gay, maybe not, certainly in love with the idea of doomed love, a brilliant writer, a man raging with insecurities, a virgin at his death, and so on. Michael Booth is a bloke who thinks he's funny and isn't really. He even makes a lazy "...and that was just the teachers!" style joke somewhere in here that I can't be bothered to find. True, he does his research well and he cares about Andersen, but he ruins the most straightforward anecdotes with lame jokes, so a book that should be fascinating in its depiction of how much Europe (and the profession of writing, really) has changed becomes merely adequate and much too long. And there are a lot of printing errors and a couple of factual mistakes in it, which really grinds my nads.